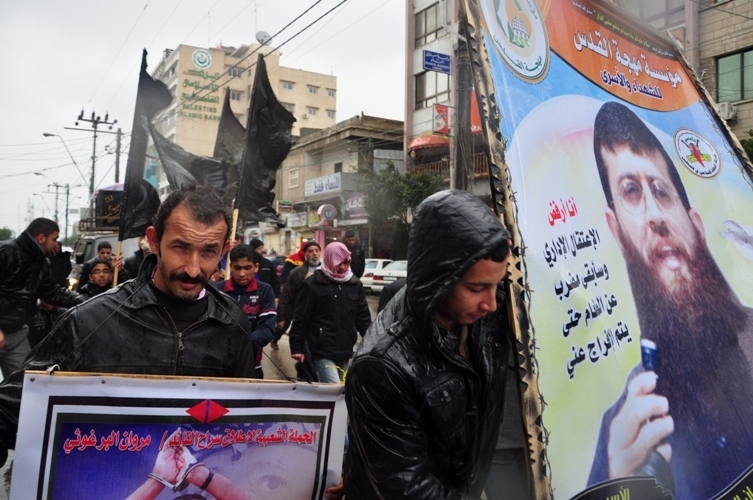 Palestinian Prisoner Khader Adnan reached the 49th day of his hunger strike against prison conditions on Saturday. This includes five days of refusing liquids as well – although Israeli prison officers have begun force-feeding him liquids to keep him alive. In solidarity, dozens of youth activists in Gaza have announced that they are joining Adnan in his hunger strike.On Tuesday, Adnan was moved to the prison hospital as his health deteriorated. He began his hunger strike the day after he entered the Israeli prison camp, to protest the illegality of his detention without charges, and the cruel treatment he received at the hands of the Israeli prison guards. Khader Adnan is one of nearly three hundred Palestinians being held in Israeli detention camps without charges, in what the Israelis call ‘administrative detention’ – the terms for these detentions are six months, at which point the Israeli officials decide whether to release the prisoner or detain him or her for an additional six months. These extensions can go on for years – the longest administrative detainee has been held for more than eight years – and are in violation of the Fourth Geneva Convention which prohibits the indefinite detention of prisoners without charges. The group of youth, who identified themselves as part of the Soul of Jerusalem Martyrs and Prisoners organization, gathered outside the office of the Red Cross in Gaza City to announce their intention to join Adnan on his hunger strike. They join dozens of detainees in prison who have pledged to engage in partial fasts and hunger strikes in recent weeks to show solidarity with Khader Adnan.